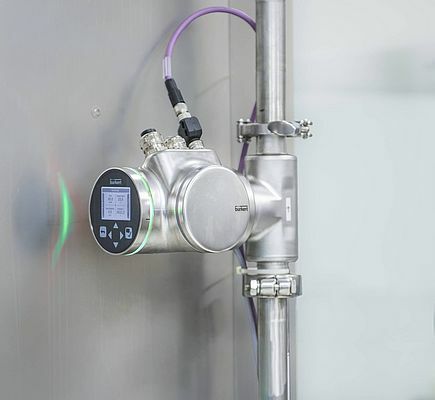 The FLOWave flowmeter from Bürkert Fluid Control Systems enables the precise detection of changeovers between different liquid types during food production. Especially in rinsing processes, rapid differentiation between product and rinsing water ensures efficient process control and a high level of quality. The device thus continuously measures the temperature-independent density factor. Based on this measured value, valuable products such as milk can be quickly and reliably differentiated from the cleaning liquid. Compared to conventional time-controlled processes, product waste can be minimised and costs saved. In addition, the amount of waste water treatment required is reduced as less product enters the waste water. The flowmeter works according to the SAW method (Surface Acoustic Waves). This patented technology can also be used to measure the transition between beer or pre-mixed alcoholic beverages and water. FLOWave utilises the propagation speed of the surface acoustic waves in the liquid for this purpose. The speed increases with the addition of alcohol and sugar. This also leads to an increase in the density factor of the liquid compared to water. However, the actual density of the liquid hardly changes depending on the alcohol and sugar content, since sugar increases the density while alcohol reduces it. The transition between beer or pre-mixed alcoholic beverages and water is therefore often very difficult to measure with conventional density meters. The density factor not only indicates the media changeover between product and water, it also differentiates between liquids with varying contents of sugar. The SAW technology allows additional data to be obtained from the medium. In addition to the temperature, the flowmeter automatically detects possible gas bubbles and outputs the values in percentage terms. Possible process faults can thus be eliminated quickly and effectively. SAW technology does not require sensor elements in the measuring tube. This means there are no pressure drops, sealing problems or dead spaces that would otherwise interfere with cleaning. The sensors thus meet the highest hygiene standards and facilitate the qualification and validation of production and cleaning processes. The Bürkert device platform EDIP (Efficient Device Integration Platform) guarantees simple transmission of FLOWave sensor data to all common fieldbuses. The maintenance-free, lightweight and yet robust meters can be mounted in any position. allows PC configuration and data logging of a wide number of control variants via an SD card slot.